THIS ITEM IS NOT AVAILABLE AT PRESENT. WE WILL NOT BE GETTING ANYMORE Star Wars Millennium Falcon UV Light Laser. From the Star Wars collection by Uncle Milton. Star Wars Millennium Falcon UV Light Laser. Release UV light to charge and create glowing phosphorescent Star Wars images or drawings that magically disappear. Has realistic sound effects. 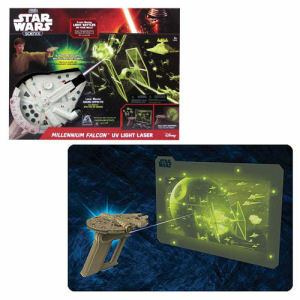 Shoot UV light blasts at Imperial Ships using the Star Wars Millennium Falcon UV Light Laser. Requires 2X AAA batteries that are not included. Uncle Milton Star Wars Electronics shipping from Canada. No Surprise Border fees or Customs!